We’re really excited to announce the availability of our fully-managed Elasticsearch Service. Our goal was to enable developers to focus on the interesting parts of their jobs: application development and relevance tuning. And leave the boring stuff: maintenance, support, care and feeding of their Elasticsearch infrastructure to us – the leading experts in open source search. We’ve seen some of our customers struggle with their hosted Elasticsearch applications, and realized there was a strong need for a fully-managed solution. We’ve taken the lessons learned from our Solr-as-a-Service solution and applied them to our new service. We want to help companies make amazing Elasticsearch applications faster, easier, and with greater confidence. 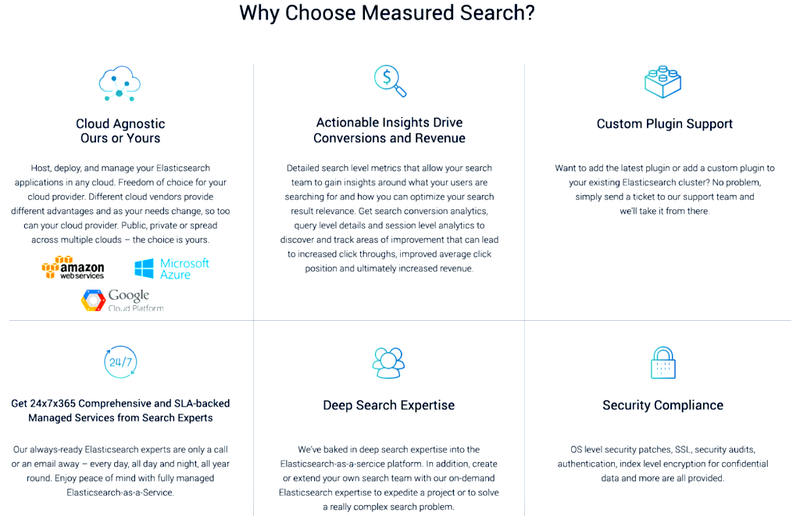 Our Elasticsearch Service solution offers automated provisioning and scaling of Elasticsearch, backups, 24/7 monitoring and alerting, comprehensive query-level analytics, and class leading administrative tools. SearchStax, combined with our Managed Services, powers the leading fully-managed cloud-agnostic Elasticsearch-as-a-Service. For more information or to schedule a demo, please contact us.